Could a Philly Republican soon become key player in Trump's Amazon beef? 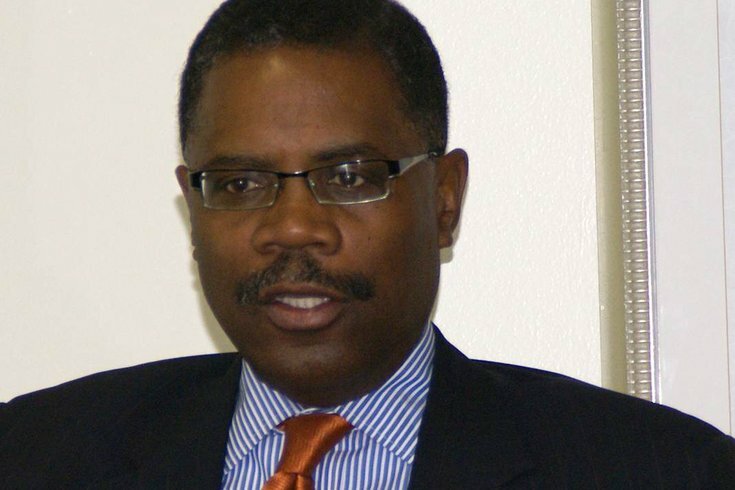 Calvin R. Tucker, chairman of the Philadelphia Black Republican Council, supported Donald Trump at the Republican National Convention in 2016. On Wednesday, April 18, 2018, he'll head to Washington D.C. for his U.S. Postal Service Board of Governors confirmation hearing. During the presidential campaign, Calvin Tucker was not only Pennsylvania’s lone African-American voting delegate at the Republican National Convention, he was dubbed “Donald Trump’s man in Philadelphia” by Politico. Soon, he could find himself in the middle of Trump’s war with online retailer Amazon, a company that Philadelphia is actively wooing to host its new HQ2. On Wednesday, Tucker will appear before the U.S. Senate Committee on Homeland Security & Governmental Affairs for a hearing on his nomination to join the U.S. Postal Service’s Board of Governors. The nomination, announced last year, was among the first for positions that had been vacant since December 2014. Wednesday's hearing will come days after Trump, amid a public feud with Amazon, ordered an audit of the USPS by issuing an executive order to reform the postal service. “The USPS is on an unsustainable financial path,” read the order, which created a task force to review the service’s operations and finances, and led to discussions about potential privatization. Dave Partenheimer, public relations manager for the USPS, said the service doesn’t comment on nominees as they go through the nomination process, but shared a statement from Postmaster General Megan J. Brennan when the nominations were first made in October 2017. “We are pleased that the Administration has announced its intent to nominate candidates for the United States Postal Service’s Board of Governors,” she said. “The public interest and the Postal Service are best served by a fully constituted Board made up of well-qualified individuals with diverse perspectives and experience. Tucker, 65, is chairman of the Philadelphia Black Republican Council and leader of the 22nd Ward in Mt. Airy. According to his website, he is also president and CEO of Eagles Capital Advisors – a financial, management and economic development consultant firm – and capital manager for West Philadelphia Financial Services Institution. Publicly pro-Trump before others in his party stepped out and similarly declared themselves, Tucker was among the African-American community leaders who met with Trump at Philadelphia's Greater Exodus Baptist Church in September 2016. When PhillyVoice spoke to Tucker after Trump's RNC acceptance speech, though, he noted that the then-nominee “spoke about the issues I’m concerned about, [specifically] creating jobs in urban areas." Interviewed by the Inquirer after Trump's surprising (to many) victory, he said, "I had the expectation that he was going to win all along. That's why I supported him." 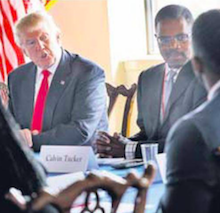 Calvin Tucker (right) seated next to then-candidate Donald Trump during a campaign visit to Philadelphia. Calls and emails to Tucker seeking comment about his nomination, and the prospect of an entrepreneurial mind examining the prospects of privatization, went unreturned this week. With Amazon promising tens of thousands of high-paying jobs to the city it selects for HQ2, Tucker's serving as a USPS governor from one of the prospective host cities while overseeing an agency under audit could become quite the delicate balancing act. Michael Meehan, chairman of the Philadelphia Republican Party, said Tucker's financial-business background will not only help him avoid any nomination challenges, but makes him "the perfect fit for the position." Being from a city long run by the opposing political party would help Tucker navigate any Amazon-related issues, Meehan said. "The USPS is a financially strapped government business entity with extraordinary legacy costs. Its core service – daily mail delivery – is being challenged by the convenience of the internet and faxes," he said. "Twenty other Amazon first-round selection winners face the same dilemma," he continued. "Calvin knows and understands challenges just by being a Philadelphia Republican. Calvin Tucker will do the right thing. We need more like him in government service." According to the USPS website, the board “is comparable to a board of directors of a publicly held corporation.” In addition to an annual salary of $30,000, each governor receives $300 a day for a maximum of 42 days of meetings annually and travel expenses, according to the USPS. Should all three nominees at Wednesday’s hearing ultimately get full Senate approval, though, it would merely serve as window dressing. With no governors currently seated, the board is operating in a “temporary emergency” status with its powers delegated to Brennan and her deputy. Should the trio get seated, the 11-member board will still be one governor short of the quorum necessary to even hold meetings, according to an NPR report. According to a bipartisan letter to Trump from the committee, this poses an array of problems. The hearing, for three nominees to the nine-member board, is scheduled for 10 a.m. Wednesday in the Dirksen Senate Office Building. If approved by the full Senate, Tucker would hold the post through December 2023.